Will 2014 be the year that those advocating for ending capital punishment in New Hampshire get their wish? There isn’t any doubt the hopes of supporters are justified for two reasons – one homegrown and the other bubbling up from outside the state. At the same time, victory is far from assured. Maggie Hassan’s endorsement of the idea during her campaign for governor last year handed a powerful ally to those who wanted to repeal the death penalty. Many observers were stunned when both Democratic nominee Hassan and Republican nominee Ovide Lamontagne embraced the idea during a forum sponsored by the Business and Industry Association. After all, Hassan’s only experience with the issue was as Senate majority leader in 2009, when she shepherded through a commission to study the issue at the behest of former Democratic Gov. John Lynch. During his eight years in office, Lynch vowed to veto any repeal bill. In fact, he signed a state law in 2011 that expanded capital punishment to include home invasions. Liberal Democrats didn’t like Lynch’s view, and the commission was a way for Lynch to placate that wing of the party. Ultimately, in 2010, the commission split 12-10 in support of keeping capital punishment. Rep. Renny Cushing, D-Hampton, is prime sponsor of the repeal bill. He dedicated much of the last quarter century to working on this cause. “I think it’s a moment in history, really,” Cushing said of Hassan coming aboard at an ideal time for the campaign to be victorious. Many consider an effort in 2000 as a turning point when both branches of the Legislature passed a repeal bill, only for then-Democratic Gov. Jeanne Shaheen to veto the measure. While the bill’s passage was a major achievement – especially with the House under Republican control – there was never any doubt that Shaheen would strike it down. She did it the day after the Senate had passed it to her. “Governor Hassan supports life in prison without parole for heinous crimes,” communications director Marc Goldberg said in what has become the governor’s stock response. But the governor’s spokesman stressed Hassan looked forward to hearing all of the debate and to respect the views of all with strong feelings about this passionate topic. Translation? This governor will sign the measure, but supporters shouldn’t expect she’s going to lean on anyone to get the job done. Rep. Mary Gorman, D-Nashua, said it’s personal. “I can’t think of carrying this punishment out against anyone, so why in the world would I want the state to have this kind of power?” Gorman asked. The other reason for supporters to conclude they have momentum is that the crusade to repeal capital punishment has been steadily scoring victories in state capitals. Since the Supreme Court re-established capital punishment in 1973, 18 states have repealed their laws. As retired Superior Court Chief Justice Walter Murphy said Thursday, six of those states have done so in the last five years, most recently Maryland last spring. “The whole issue requires light; people have to look at the facts,” Murphy said. Cushing and other supporters are too savvy to take either legislative branch for granted. “We are working this one vote at a time and approaching everyone like it’s a new issue because there is new evidence that capital punishment is not working,” Cushing said. But the reality is the Democratic-controlled House is widely considered almost certain to give its approval. The lower chamber has always been an easier place for those behind this movement to do their work. Even when the Republican-dominated Legislature voted to expand the death penalty to cover home invasions in 2011, there were still signs of support. Lynch strongly endorsed that expansion, and then-House Speaker William O’Brien, R-Mont Vernon, had authored it, both motivated by the savage 2009 slaying of Kimberly Cates in O’Brien’s hometown. The expansion bill passed the House 198-153, but more than 60 House Republicans had opposed it. About 40 of them are still serving in the House. “We’ve always had strong support from many Republican legislators both on religious grounds and those with libertarian leanings,” Cushing said. But the Senate, where Hassan comes from, is a much more unpredictable place. While the Senate voted 14-10 to repeal the death penalty in 2000, only two of the 24 are still there today. They are Senate Democratic Leader Sylvia Larsen, of Concord, who was for it, and Deputy Democratic Leader Lou D’Allesandro, of Manchester, who opposed it. Senate President Chuck Morse, R-Salem, voted against repealing the death penalty as a House member, and he hasn’t changed his mind. 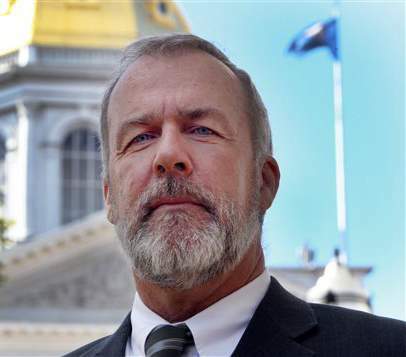 Morse has told colleagues that while retaining capital punishment has been part of the New Hampshire Republican Party’s platform for years, he wants each senator to make up his or her own mind. Freshman Sen. Jeff Woodburn, D-Dalton, is one of those widely seen as persuadable by both sides. Support for the death penalty has always been strong in the North Country, which has been the scene of some gruesome crimes, such as the shotgun slaying in 1997 in Colebrook of two state troopers, a part-time district court judge and newspaper editor. “I think we have a good law in New Hampshire, but the question is, Should this be what states should be doing in 2013?” Woodburn asked in an interview with The Concord Monitor. The role of law enforcement in supporting capital punishment will help determine whether 2014 is just another year of early promise and late disappointment for those who want the law repealed. Attorney General Joe Foster, of Nashua, has been on the job for only five months, and he follows a long line of state prosecutors who backed the capital murder statute. He’s considered likely to continue the tradition, but Hassan’s support for repeal of the law could temper that campaign. It also remains to be seen how much political pressure will be applied to individual state senators as they weigh whether a vote for repeal could have them cast as soft on crime in an election year. “We’ve never seen that happen here in New Hampshire, sitting legislators tossed out of office because of their views on the death penalty from either side,” Cushing said. This may be so, but more than one Democratic senator from the Manchester area has supported the death penalty, and long before the slaying of Manchester Patrolman Michael Briggs in 2006. William Addison is appealing his capital murder conviction in that case, and the New Hampshire Supreme Court is expected to rule on it before lawmakers complete their work on the death penalty bill next year. Along with local and state police authorities, the New Hampshire Union Leader has been an aggressive supporter of the death penalty. Kevin Landrigan can reached at 321–7040 or klandrigan@nashuatelegraph.com. Also, follow Landrigan on Twitter (@Klandrigan). Link to article on Nashua Telegraph site.